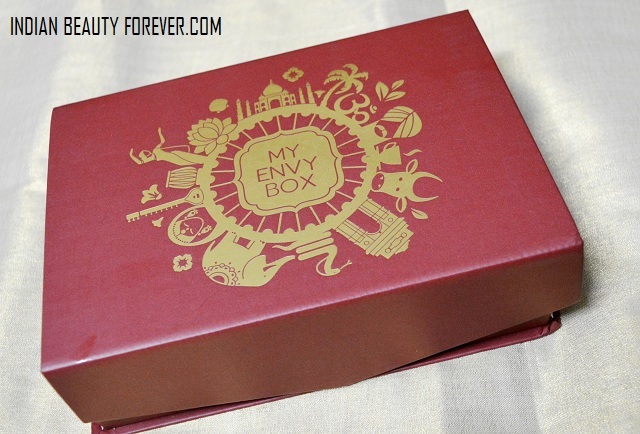 I am little late in posting this review and unboxing of My Envy Box August 2015. 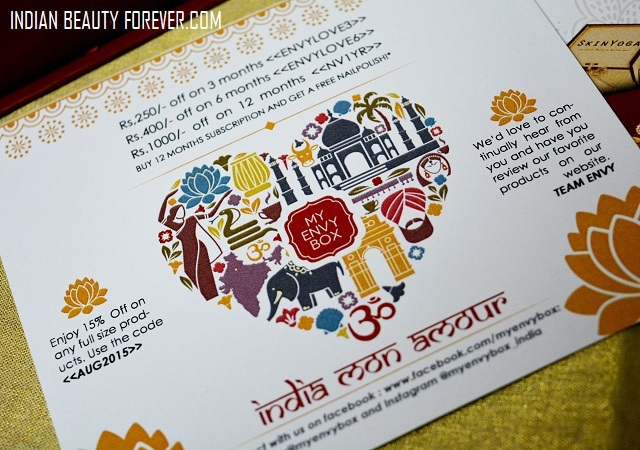 This month’s theme is India Mon Amour. 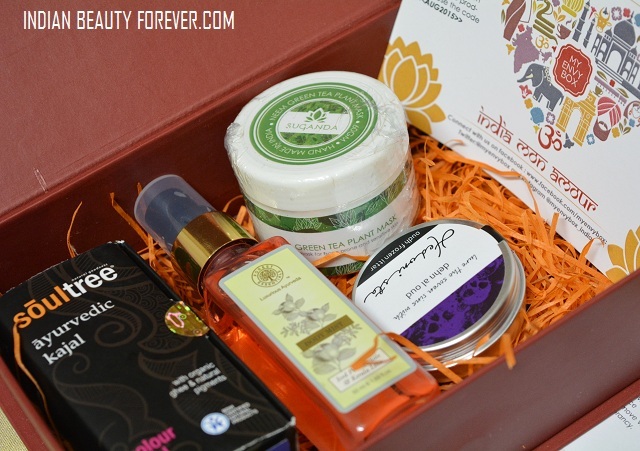 This is an all Indian products box that is filled with goodies which are Indian and mostly have their roots to the ancient Indian beauty culture. I loved the reddish brown box with Golden print that with just a picture says a lot about India. Says a lot about the diversity of religion and culture. I loved it, it can’t be any better than this considering that this arrived few days before the Independence day. Alright so, let’s see what all products are there. 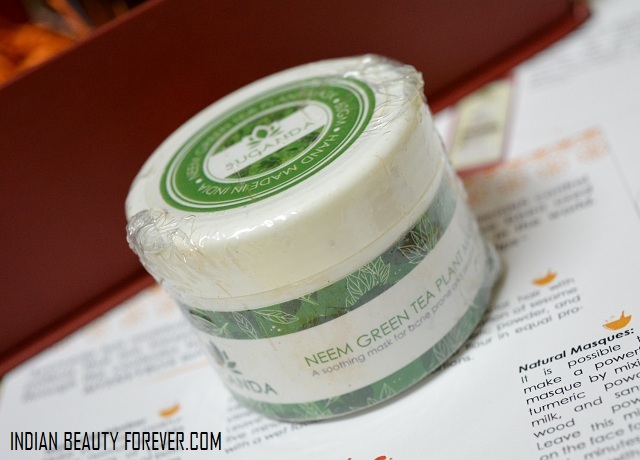 I like everything skin care related that has neem in it. I have combination acne prone skin so, I would be definitely using this. I think this can be used 2-3 times I think, according to the size of the jar. 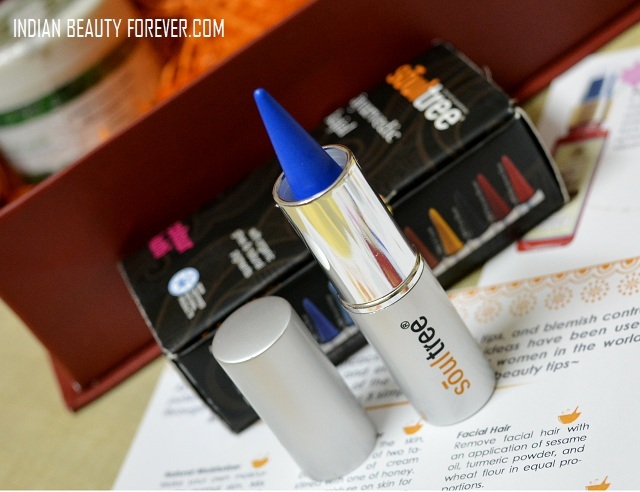 I already have this kajal in black and it was good and this bright cheerful blue would be good to flaunt for the summers. May be I can double it up as eyeliner or kajal. Oh, it reminds me of one more thing, I can also use this on the lower lash line just for a pop of color. This frozen itar is like a counterpart for Solid perfume. 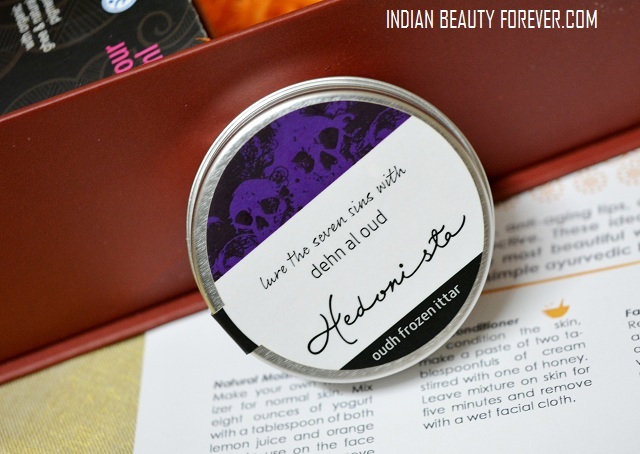 This is a full sized product and this has this exotic Indian essence to its scent. This has a very spicy, not too strong yet dominating. I liked this too. This has a semi molten clarified butter (ghee) like texture and just little bit of this needs to be applied. 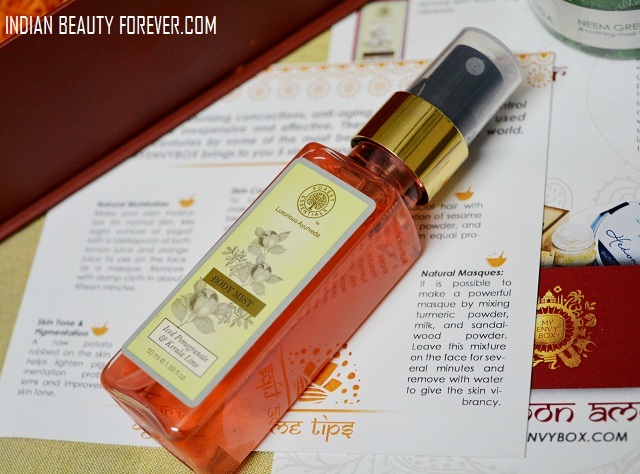 This is a body mist which is extremely refreshing and seems like a must have for summers. For 2 reasons, the menthol crystals which gives this a cooling sensation as soon as it is sprayed on the skin. Secondly the fragrance of pomegranate mixed with Kerala lime. Gosh!! Can’t describe how invigorating this can be as a summer body mist. 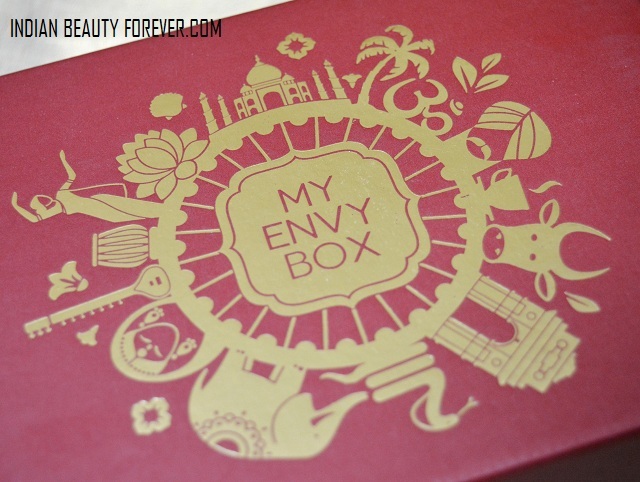 So, overall I can say that I have loved this month’s My Envy Box. It was really worth trying the products that they had included. 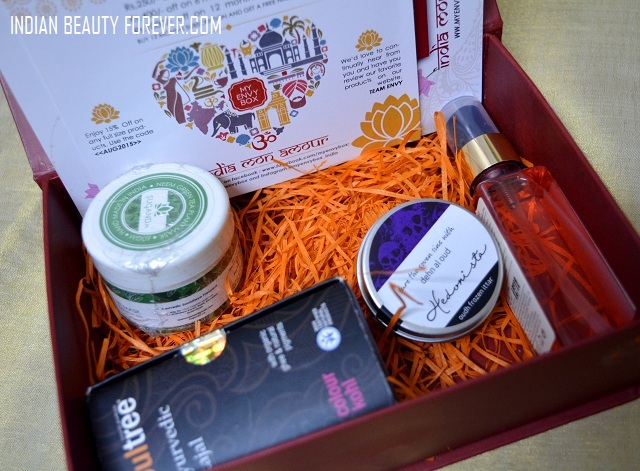 The box was embossed with such lovely print on top which could not have been better for this month’s theme and the Independence Day being in the same month. Nice products. Body Mist sounds great. I like very much the design of the box and the content of it looks great too! I got same products and i agree about both fragrances.. they are superb and long lasting.. I have used soul tree kajal in black, it has awesome pigmentation.